The GOME-2 instrument on EUMETSAT's Metop polar satellite series is a spectrometer observing the Earth in the ultraviolet-visible-near-infrared range. From these spectra many data products are being derived, such as ozone, UV irradiance, NO2, SO2, aerosols, clouds, and other atmospheric constituents. The goal of this Special Issue is to combine and summarize the scientific work related to GOME-2 onboard Metop-A (launched in October 2006) and Metop-B (launched in September 2012). The Special Issue is open for contributions about GOME-2 calibration, level 0-1 and level 1-2 algorithms, data products and validation. 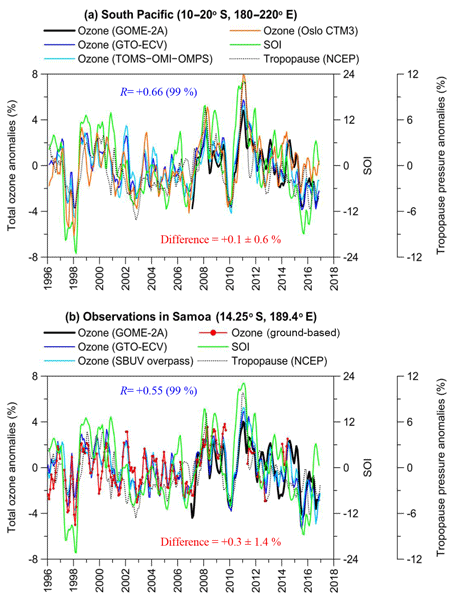 We examine the ability of GOME-2A total ozone data to capture variability related to known natural oscillations, such as the QBO, ENSO and NAO, with respect to other satellite datasets, ground-based data, and chemical transport model simulations. The analysis is based on the GOME-2 satellite total ozone columns for the period 2007–2016 which form part of the operational EUMETSAT AC SAF GOME-2 MetOp A GDP4.8 latest data product. Comparisons between satellite and ground-based measurements of the atmosphere are inevitably affected by natural variability due to mismatches in co-location and differences in smoothing. These additional terms in the comparison error budget are quantified here for total ozone columns using an Observing System Simulation Experiment. Even when using tight co-location criteria, atmospheric variability is found to contribute significantly to both the median and spread of the differences. The surface ultraviolet radiation product generated operationally in the framework of the Satellite Application Facility on Ozone and Atmospheric Chemistry Monitoring of the European Organisation for the Exploitation of Meteorological Satellites is described. The product is derived from measurements of polar orbiting satellites and contains important quantities of solar radiation that can be harmful to life on the Earth and affect atmospheric reactions related to air quality and climate change. We present an extensive sensitivity study of retrieved total ozone columns from clear sky Global Ozone Monitoring Experiment 2 (GOME-2) measurements between 325 and 335nm which are corrected for instrument degradation. We address the choice of the scaling ozone profile, the choice of the radiative transfer solver, and the approximation of Earth's sphericity. Finally, we study the effect of instrument degradation on the retrieved total ozone columns for the first four years of the mission. This work presents the air mass factor (AMF) algorithm in use at the University of Leicester, which introduces scene specific variables into a per-observation full radiative transfer AMF calculation, including increasing spatial resolution of key environmental parameter databases, input variable area weighting, instrument specific scattering weight calculation, and inclusion of an ozone vertical profile climatology. This work thoroughly discusses a methodology, as summarised in a flowchart, for the round-robin evaluation and geophysical validation of nadir ozone profile retrievals and applies the proposed best-practice to a pair of optimal estimation algorithms run on exactly the same level-1 radiance measurements. The quality assessment combines dataset content studies, information content studies, and comparisons with ground-based reference measurements.